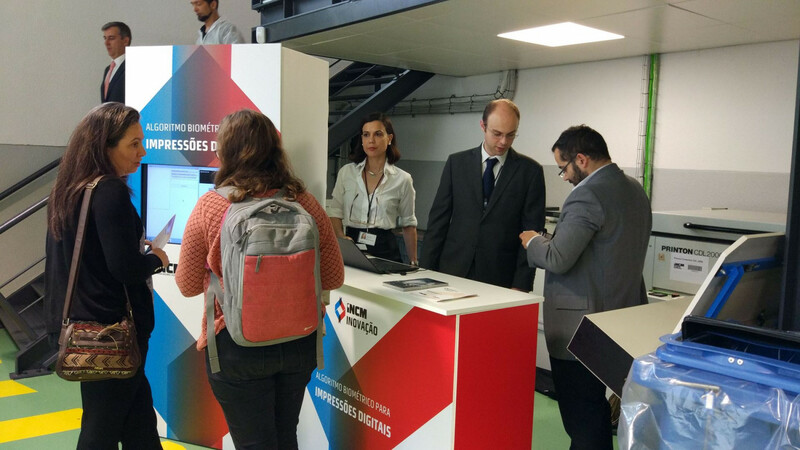 On 24 May, a project of INESC TEC developed in partnership with the Portuguese Mint and Official Printing Office (INCM) was one of the highlighted presentations of the innovative ideas exhibition, that have already been implemented or that are still being developed by INCM. The new biometric algorithm for fingerprints, which was developed by INESC TEC, consists of a biometric security application for identity authentication and recognition used in identification documents. It is already being used in the Citizen Card. More details can be found on Ana Rebelo's interview here. This work required an interdisciplinary partnership, involving different research centres, namely the Centre for Research in Advanced Computing Systems (CRACS), the Centre for Information and Computer Graphics Systems (CSIG), the Centre for Telecommunications and Multimedia (CTM) and the High-Assurance Software Laboratory (HASLab). INESC TEC was represented by Ana Rebelo and Hélder Oliveira, researchers from CTM. This Innovation Exhibition took place in parallel with the second edition of the INCM 2017 Innovation Prize ceremony awards, whose finalists’ ideas were presented and distinguished in the event that took place at the Mint’s pavilion led by the Minister of the Presidency and of Administrative Modernisation, Maria Manuel Leitão Marques. The project INTMOB - Intralogistics Mobile Assistant Unit for Flexible Manufacturing Systems ended up in the first place. It plans for the creation of an autonomous robot for INCM intralogistics based on the industry 4.0 paradigm. The project “Fabrico de Moedas Comemorativas através de Tecnologias Aditivas” ("Manufacture of Commemorative Coins through Additive Technologies” in English), classified in second place, consists in the use of 3D technologies for the production of disks with complex geometries and three-dimensional details. Finally, in third place was the BlockCarPollution project, which aims to make available to users of public and shared transports an intelligent reward system capable of creating a virtual wallet and generating virtual coins when purchasing tickets to associated transport entities. The winner prizes were worth EUR 500M, EUR 250M and EUR 100M, respectively, allowing the development and growth of these works. The session had also the intervention of João Paulo Oliveira, member of the Executive Board of Navigator and partner of INCM, with the presentation entitled «A importância da Inovação para a competitividade das empresas» («The importance of innovation for companies' competitiveness» in English). The INCM Innovation Prize intends to select and reward ideas that allow the creation of innovative solutions that can be part of the corporate purpose of INCM, namely in the areas of: new security elements; development of Information and Communication Technologies; new business models; growth and improvement of production processes and new services and products that cover unique concepts and technologies.